After more than three years, TXP (Magazine) is back, and in a big way. Under new editorial direction and with strategic aims, there’s a lot to introduce in this first issue, including the magazine’s new identity and publishing agenda, the amazing team of people making it happen, and what you can expect in the future. And that says nothing about the other six cork-popping articles in this issue to kick things off: two profiles of remarkable Textpattern users, our pilot plugin review, a fantastic piece for you independents out there, a detailed look at the new default theme shipping with Textpattern 4.5, and a proposal for a new piece of identity in the Textpattern family of websites. We’re hitting the ground running with Issue 1. With the relaunch of the magazine comes a new focus on the magazine’s identity, format, and publishing schedule. We on the editorial team conducted a simple review of other web magazine brand names—including .net, A List Apart, and Contents, among others—and we observed that few actually use “Magazine” in their brand identity. Rather they reserve use of the word in URLs, legal copy, and so forth, if it’s even used at all. This makes sense. A magazine is just a genre, after all, like Textpattern Solutions is a book and Blade Runner is a movie. There’s no need to beat it to death as a proper noun. Under this logic, and in-line with the industry trend we observed, we unanimously decided to drop “Magazine” from the name. For all intended purposes, TXP Magazine is now just TXP, which is a pretty hip name for a mag, if we do say so. Like the other respected web magazines we considered, we’ll keep using “magazine” in the web domain, in the copyright statement, and other places concerning business communication. We are acutely aware that many in the Textpattern community use “TXP” as an abbreviation for the CMS itself, and have been doing so for a long time. It has become fashionable, unofficially so, but likely without much consideration to the true scope of things. Most obvious is that people don’t distinguish between Textpattern, the whole project, and Textpattern CMS, which is just one piece of it all. The project means many things: the international community of users, the culture and courtesy one experiences in the support forum, products like the CMS (of course) but also contributed plugins and packs (e.g, the Multilingual Pack, or MLP), all the project websites (TXP being the latest addition), social channels, the new swag store (to be discussed), affiliations and partnerships, and perhaps other things to come as the project evolves. All of these things in various ways make up any open source CMS project. 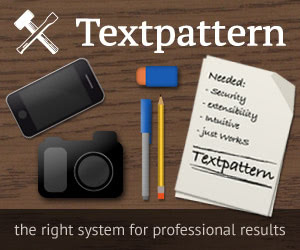 Textpattern is no different. Since the magazine’s creation in early 2005, its scope has always been the entire project (and web design in general). We will continue in that vein, but with a more focused agenda, and with an outward reach to the CMS market overall. For us, “TXP” clearly symbolises everything Textpattern, not just the CMS, and thus makes the perfect magazine name. Besides the obvious design changes, TXP adopts a more classic magazine format with regular topic columns and a routine publishing schedule. TXP will now be published quarterly on an issue basis. Articles in each issue are associated to columns having specific themes. There are currently eight columns planned, including the Editor’s column, and they’re defined as they become active. Between five and seven articles will be published each issue, representing at least four columns. Sometimes this means more than one article in a given column. An editorial calendar is maintained, and content is planned up to two issues ahead of time. Article contributions are encouraged, and we anticipate it will become increasingly competitive to be published as time goes by, due to a limited number of articles each issue and an increased interest by contributing authors and editors if/when money can be given. Where will this money come from? Advertising, we hope. There is a reason the magazine is back, in the hands of Textpattern, and with a focused editorial effort behind it. TXP will serve as a voice between the project and the rest of the world, with the overlying goal of improving brand awareness. TXP will be, effectively, a public relations channel. Textpattern is not without some brand recognition problems, in fact (a subject for a future article), and TXP will help to clear these problems up in the course of publishing great content. One obvious step in the right direction, which has always been needed, is to draft and adopt various guidelines that support project content, design, and development. Content guidelines would include things like the user documentation guide, and other authoring resources, to ensure better use of language, style and tone across project websites, and a consistent taxonomy in the CMS interface and code. Design guidelines would include things like presentational style guides used on project sites, and visual brand identity guides to help steer future decisions about Textpattern brand changes and appropriate use. Development guidelines will be more specific, technically speaking, and aimed at community developers to help shape the course of future CMS versions. This collection of references won’t be written all at once, but they will be outlined and prioritized so progress can be made on them between magazine issues. A new website may eventually be established to centralise all project guidelines and references in one place, not unlike the Ubuntu Brand Guidelines website. Our references site would be public access to encourage widespread use of the information, and all guides would be written in HTML format so each type of guide can be demonstrated as well as defined. This website could feasibly host other project references too, as the shoe might fit. Past readers, and new readers too, may now wonder who owns TXP and how it’s operated. TXP is a joint collaboration between project leadership and community members. There are three tiers of contribution with cross-over between them: ownership, editorial, and authoring. This is simply the people currently in charge of the Textpattern project. For purposes of TXP discussion, we call them the “Board” to distinguish from discussions regarding CMS development, in which case they are commonly known as “core developers”. For the most part, the Board is a silent voice in the operation of TXP; its concern is mainly to ensure the technical platform (hosting, server…) stays live. When communication is needed between the Board and editorial operations, it takes place between the Editor-in-Chief (currently me), the core lead (currently Robert Wetzlmayr), and Stef Dawson, who is an essential link between both parties. This is the operational level of the magazine. Production and decisions about editorial strategy take place here. There’s a core editorial team, and defined roles. As opportunities arise to be involved, they will be advertised. The magazine aims to be a quality content resource for the entire open source CMS industry, and the range of columns help provide for this. Column editors will contribute their own content, but the public is encouraged to submit articles too. With respect to two of our columns, The Independent’s Frontline and Hope for the Future (our opinion column), authors don’t need to be Textpattern users. We only require that article submissions are relevant to column topics. We’ll provide editorial review and direction to ensure they are. Writing and editing great content is hard and time consuming. We understand this. Our aim is to eventually get to a point with advertising (discussed later) that we can give a modest amount of something back to contributing authors. In the meantime, we editors will do the best we can with content, and if people out there would nevertheless like to submit an article idea without expectation for compensation, we’re happy to have your contribution. One thing I love about collaborative work is the opportunity to learn from other smart people. I’m in good company here, and I’d like to give the other people on the publishing team a special introduction. Each brings a unique perspective to the cause, and some contribute to more than one role. Their names link to their bios, so you can follow up with more about them if you like. Stef Dawson: If you’re a regular in the community, you know this English gentleman and probably use several of his amazing plugins. At least we assume he’s a man. His non-stop contributions to community and core development suggest he might be cybernetic. Stef is the person who initiated this whole effort; acquiring the magazine domain for Textpattern and asking me on behalf of the Board to give it direction. Stef is the magazine’s lead developer, and editor of the Extension(alism) column, and he’s written us a good article for the admin-side plugin, adi_recent_tab. Hats off and low bows to this ma(chi)n(e). Ralitza Dilovska: Ralitza is an independent UI designer and consultant in Germany, and a long-time user of Textpattern CMS. I’ve always appreciated her sincere interest in Textpattern project affairs and no-nonsense approach to the truth of things. I was very pleased she accepted my invitation to be involved. Ralitza is editor of the Community Spotlight column, where she and I will be finding and profiling notable folks from around the world who use Textpattern CMS in interesting ways. We have two Spotlight articles for you this issue: one with Marie Poulin, who I’ll come back to shortly, and one with Jean François Porchez, the reigning king of typeface design in France. Kevin Potts: When we get our writers and editors, we get them big. Kevin is a repeat writer for A List Apart, and the principal author—along with Rob Sable and Nathan Smith—of Textpattern Solutions, the only book ever written (so far) on Textpattern CMS. Kevin’s also a Windows user and doesn’t own an iPad (two facts that apply to half of the team, actually), but don’t let that fool you, he’s a talented “UI junkie” and a mean Textpattern architect, and if you’ve never seen his site, or seen it lately, then give that thing-of-simple-beauty a look. We’re darn lucky to have Kevin as editor for The Independent’s Frontline column, and he’s written a zinger for this issue—Communicating your value. Marie Poulin: Marie is an independent web strategist and designer hailing from Vancouver, B.C., or at least that was her last known place of address. Apparently she’s on the lam. Well, lam or not, having her on the team is a bit of fresh air because most of us are pretty well-known around the Textpattern watering hole, and she’s really not at all. (Or maybe I’m just not with it.) But that’s about to change because Marie is our Site Watch editor and takes a spot on the competitions committee too; two roles that are, as I’ll explain later, inextricably entwined with the forthcoming sites Exhibit. Don’t miss Ralitza’s interview with Marie; she’s the only person on the publishing team that will be interviewed in TXP. Les Smith: If we go all the way back to the birth of Textpattern, Les was there, in Vancouver B.C., and knew Dean Allen when he was there too putting code together that would become the great CMS we all know and love today. Les was a beta user of Textpattern and has been a consistent contributor to the community ever since. You might know him as “Lazlo” in the Textpattern Support Forum. Les made a surprise appearance last September at the first ever Textpattern London meetup, and it quickly became clear to me that he was the socialite we needed to make sparks happen in Textpattern’s wayward social channels. With my encouragement and some blessing from the Board, Les has settled in as Textpattern’s Community Manager, and all around voice of reason on the publishing side of things. He’s not one we want to lose. 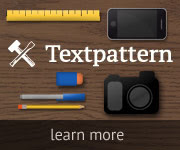 Do engage with Les, he’s one of a few voices behind @textpattern and @txpmag, and his own account is @typesmith. Phil Wareham: Phil also joins us from England, where he makes up part of the Design Hive colony in Farnham. He’s recently made a big contribution to the Textpattern project by developing a new front-side theme that officially becomes default in the next CMS version. In fact, Phil tells us all about it in this issue’s Meaningful Labour column, so do go read A new default theme for Textpattern 4.5. Phil now has his eye on the admin-side theme too, which is exactly why I’ve asked him to be involved here. Phil has boldly accepted honorable charge of the Competitions Committee (sometimes referred to as Evaluations Committee), which, as the name suggests, will be a group leading the coordination of future theme competitions organised by TXP, as well as evaluating websites for entry into our forthcoming Exhibit (more on that later). Phil’s ongoing relationship with the front and admin-side markup makes him the perfect candidate for this role. More immediately, he contributed greatly to making the magazine’s new HTML5 templates cross-browser ready (i.e., IE-friendly). Lastly, there’s me. I will always write From the Editor articles, and one or two more as needed each issue, though I hope your contributions will be such that I can focus on the direction and editing aspects of TXP and leave the writing to you. Besides this article, I’ve written the profile piece on Jean François Porchez, which was a real pleasure to do, and I’ve written TXPs first opinion piece in Hope for the Future, proposing a Textpattern emblem for Textpattern’s family of websites. There’s one more person I need to acknowledge—Shimelle Laine. Shimelle was the only person on the entire planet who responded to an early call to help me audit the old magazine’s Sites Collection entries, and what a depressing job it was. Few of the gallery entries were Textpattern-powered sites anymore; most were either WordPress or Tumblr, if the links even worked at all. Sites we found still driven by Textpattern, after three-quarters through the audit, were such poor examples of showcase design that we decided to clean the slate and start anew. Yet up to that point, Shimelle soldiered on, taking the occasional break to muster strength needed to return again each time until I finally gave her the good news to cease and desist. Readers, please go check out Shimelle’s website. It’s awesome. She’s a scrapbook queen! And she’s super nice. The site is Textpattern, of course. We’ve taken a strong turn toward advertising. Let’s go over that as it concerns the exchange of money. Everybody likes that topic, right? Since forever, core developers of Textpattern have had a hard time seeing anything for their efforts in maintaining and evolving Textpattern CMS. The sum of community donations, however good-willed and appreciated, don’t come close to the kind of compensation deserved, and probably some more than others if you consider time put in. Certainly developers do what they do because it’s a labour of love, but that doesn’t mean the project shouldn’t have some financial stability. We don’t know if advertising is the answer, but we’re now running a magazine and taking it seriously, so it provides a good opportunity to try. We begin displaying advertiser campaigns in issue 2 , and you get to enjoy the lovely Textpattern ad creative we’ve designed until then. I will be writing about the design of our package next issue, and Stef will be writing a complementary article about the related ad rotation technology he’s developed for it. But if you’ve been following the first discussions on responsive advertising by the likes of Mark Boulton, Nathan C. Ford, Trent Walton, Andy Clarke, and others, then you know it’s new territory in web design/advertising, and a hot topic with some interesting business challenges. Assuming it works out, and I’m oddly confident it might, a plan that defines funds distribution back to the project will be needed because money gained from TXP advertising won’t all go directly into core developer pockets. The distribution plan will be worked out between the Board and editorial team, but it would certainly make allowances for magazine needs and future initiatives, not the least of which would be offering some kind of payment to contributing writers, and to the editors who will be working with them to ensure quality content. The magazine’s new structure should be evident, and we hope you like the design, which started off as a concept of mine that we all refined together—a true group effort. Please explore the site top-to-bottom and inside out, and if you have anything you want to say or share, consider going to our TXP Google+ page where we’re happy to hash over whatever you want. What you don’t see yet are two more main navigation items—Topics and Exhibit—and articles in issue 1 representing the Site Watch and Showdown! columns. I’d like to finish this introduction by covering these a bit so you know what’s coming. Topics will simply be another way at getting to article content, so there’s not much to say here. It’s just not in the navigation yet because we’re starting with a clean slate and issue 1 articles are easy to get at. The Exhibit replaces the old Sites Collection, but with a whole new twist. No longer will just any website built with Textpattern CMS be added to it. It’s time the project properly displays stellar examples of incredible work done using Textpattern CMS. The Exhibit’s intended audiences are independents and people representing businesses who are on the hunt for a new publishing system. The Exhibit aims to be the place you point people to when someone asks, “What are great examples of sites built with Textpattern CMS?” The Exhibit will be a thing of quality, not quantity as it was before, and it will be beautifully presented and easily scanned. Phil’s committee, which at the moment is just he and Marie with my intrusions (we’ll be looking for two or three more committee members to get involved), are drafting and refining a set of site evaluation criteria. This will be a comprehensive set of metrics, covering everything from content to development. The criteria will be designed to rank websites across criteria benchmarks and measures, ending with a final score. Naturally, website types (e.g., blogs, .gov, non-profits, e-commerce, portfolios, design agencies, etc.) will fare differently in the evaluations, so there will also be categories in the Exhibit to account for this. Candidate sites will be considered and selected for evaluation, and the committee will conduct the site evaluations using the scoring criteria. Sites with the best scores will be added to the Exhibit and categorised by type, accordingly. Each category will be limited to a certain number of sites displayed, which is why the rank value is important, because only sites with the highest scores are displayed. These category limits may be different depending on the popularity of a given website type. For example, we can expect blogs, portfolios, and agency sites to be more numerous in the wild than government, academic, and e-commerce sites. At first the lists in the Exhibit will simply fill up, and the editorial team will be selecting those initial sites to evaluate. Once the lists are full, it becomes more competitive. After sites are evaluated, if their scores exceed that of a listed site in a relevant category, it’s added to the list and the site having the lowest score drops out. We will not maintain an archive of sites in TXP like was done before, which is nothing more than a link exchange that becomes increasingly corrupt over time. The audit on the old Sites Collection clearly proved this. When a site drops out, it really drops out. However, this is where the Site Watch column comes in. No doubt some readers are already squeamish about the Exhibit concept and the idea of sites dropping out of display. But squeam not, because that’s what the Site Watch column takes care of. Every site evaluation will be written-up as a quality article detailing the design and development, and the people who did the work. These quality articles will remain, even if the sites in question fall out of the Exhibit display over time. There’s just one pebble to turn, and that is a mechanism for selecting what sites get evaluated. In other words, how do they come to the attention of Phil’s evaluation committee? The magazine could do this, and it will in the beginning when Exhibit lists fill up, but it could also be an opportunity for community involvement later. Perhaps there is some pre-screening, or group suggestion step on the community’s side that offers up what sites we might eventually consider evaluating. It won’t work if we open it up and let individuals suggest their own sites, we need a way that filters candidate sites by community recommendation. We won’t make any decisions about it now. And we’re happy to listen to your ideas if you have any, whether in the article comments while they are open, and/or over at our TXP Google+ page. Just keep in mind the relationship between Site Watch and the Exhibit, and remember this isn’t a competition (those are coming but entirely different activities from this). The real objective here is to provide excellent examples of Textpattern sites to prospective CMS hunters out there in the wild. We have our first Site Watch article planned for Issue 2. You’ll just have to wait for the surprise. This is another column we hope to introduce in the second issue. The idea behind this column is to provide unbiased benchmark comparisons of Textpattern CMS with other open source systems, one such comparison per TXP issue. No doubt people would like to see monumental duels like Textpattern CMS versus ExpressionEngine, or Textpattern CMS versus MODx, and those would certainly be comparisons we’d make. But we also thought it could be fun if the first Showdown! column compared Textpattern CMS with Escher CMS, the open source system developed by one of Textpattern’s own core developers, Sam Weiss. Whatever one we do first, it would come a lot sooner if we had an editor for the role. Without an editor, these articles may be few and far apart, if they can be managed at all. Even just one CMS comparison every 3 months is a lot of work. We need a Showdown! column editor to join the team and take charge of it, because unbiased CMS comparisons would be a great contribution to the open source CMS industry. Such comparisons would also have the potential to be tremendous draws for TXP, and in turn could be good for advertising, and so forth. If you’ve a penchant for test driving all the open source systems out there, you’re not a stranger to benchmark comparisons, and would like to be a key member of the editorial squad, we’d like to hear from you. By this point you’ve been hearing about the store and upcoming competitions. These activities are worthwhile endeavors for an open source community, and Textpattern has experienced these things before. Yet when organised by the community and not the project directly, activities like these tend to be short-lived affairs. We’ve decided they should become regular community assets with stable support, so we’re bringing these initiatives back and ensuring they have long-term plans, even if that means a plan for termination at some point. The success of these activities rely on a mutual relationship with the community. We hope you take an interest in store merchandise, and participate in competitions when the time comes. Would excellent prizes help? And with that I’ve come to the end of my first From the Editor article, clocking-in at over 4,000 words. Take heart in knowing my Editor articles will never be this long again. Thanks for reading. I hope you like TXP.